When I first met my boyfriend he’d barely ever cooked a thing, having served 5 years in the army, he’d been fed three times a day and never had to. However being a big food lover and knowing how big a foodie I was, he won me over when we were first dating by cooking me homemade jerk chicken from scratch. The rest, as they say, is history. In the years since, and particularly since living together his skills in the kitchen have come on leaps and bounds and now I’m letting him have his own little piece of glory on the blog! Inspired by TV programmes like Jamie’s Money Saving Meals and the BBC’s Eat Well for Less, he’s recently got quite into the idea of doing homemade takeaways, or ‘fakeaways’ as I like to call them. We can both cook so there’s nothing stopping us making our own versions plus its easier on the purse strings and friendlier on the waistline. The first ‘fakeaway’ dish The Boyfriend has gotten down to a tee is this donner kebab. Now, as a takeaway dish, a kebab isn’t really an option I’d go for. I’d much rather order a curry or a Chinese. However, I’m absolutely mad about this homemade version, I’ve requested it on more than one occasion since he first cooked it. Essentially this is really just a meatloaf, the recipe is really all about getting the balance of seasonings right. It’s also so ridiculously easy, it’ll be ready quicker than you can get down to your local kebab shop and back. 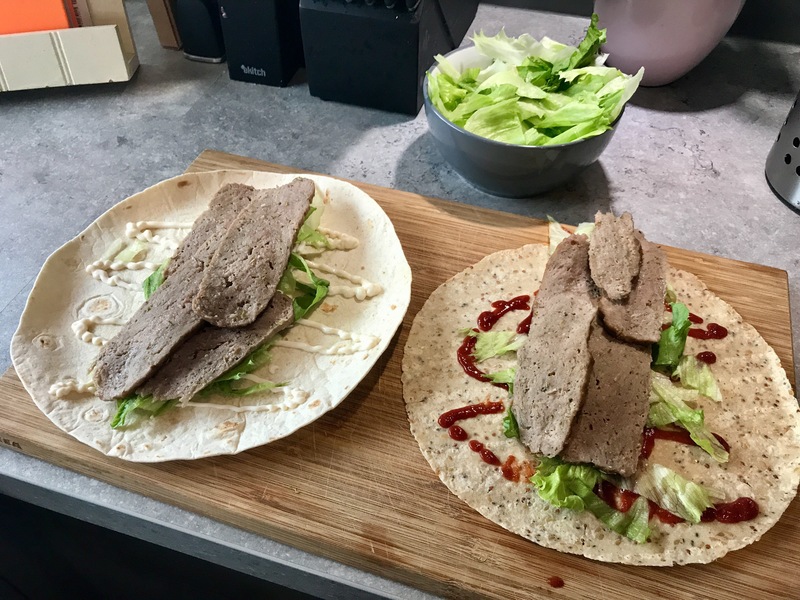 We’ve kept it simple for lunch this time and just filled a wrap with the donner meat, lettuce and sauce (garlic sauce for me, BBQ for The Boyfriend), but there are lots of different ways you could serve it. Lots of people would prefer the traditional pita to a wrap or you can leave out the bread and just serve the meat with a good portion of salad, or go all out and cook up a batch of homemade chips to go on the side. From the recipe below you’ll get about 4-5 portions of meat, once you’ve sliced it all up, so it’s a good make ahead and use throughout the week option if, like us, there’s only a few of you to feed. 1. Preheat oven to 175° and line a loaf tin with grease proof paper. 2. Knead together the lamb mince with the onion granules, pepper, Rosemary and salt. You want to ensure all of the meat is thoroughly seasoned throughout. 3. Spread evenly into tin to form a loaf, push into edges if necessary. 4. Bake in the oven for 30 minutes. 5. Remove from the oven and allow to cool so that it’s easier to handle. 6. Slice as thinly as possible and serve with lettuce, and wraps or pita bread with your preferred choice of sauce.